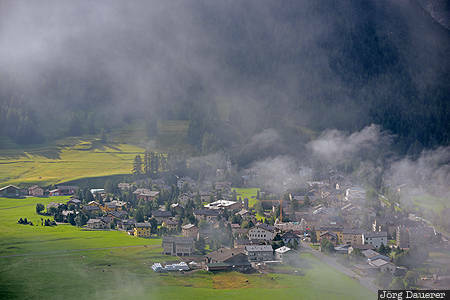 Morning Fog above the houses of La Punt seen from the road to Albula Pass. La Punt is in the Engadin Valley in Canton Grisons (Graubünden) in Switzerland. This photo was taken in the morning of a sunny day in August of 2016. This photo is part of the exhibition Urban Fog (October 2018). This photo was taken with a digital camera.